Click on Yellow Links Above to Learn More! 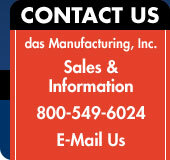 das Manufacturing, Inc. has been offering permanent marking systems since 1983. We have a performance proven system for leaving your mark on virtually any flat surface such as concrete, asphalt and metal. Our markers are ADA compliant. Storm Drain Marking is an important part of your Public Education and Outreach Program. © 2019, das Manufacturing, Inc. All rights reserved.